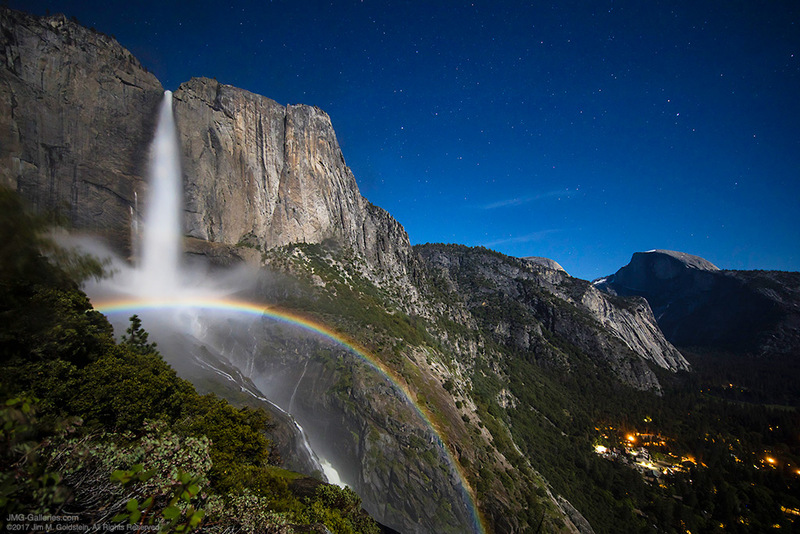 A wide arcing moonbow stretching across Upper Yosemite Falls on a clear night moonlit night in Yosemite National Park. This past week was the optimal time to photograph moonbows in Yosemite Valley. I revisited photographing the moonbow at Upper Yosemite Falls as I had last year, but this time there was considerable more water and as a result the moonbow (rainbow by moonlight) was more easily seen. It was considerably larger, more vivid in color and wider arching. Conditions were great and at times a little too good as the 3 cameras I set up were completely drenched. If you’d like to read about what it took to get this photo be sure to check out my last blog post, Upper Yosemite Falls Moonbow – Getting The Shot, as it goes into a lot of detail about the hike and the challenges I faced. If you’re curious about gear and settings this was taken with a Canon 5D Mark IV and Canon 11-24mm f/4 lens. Settings were ISO 640, 15 seconds at f/4. Insanely beautiful!!! Thank you for sharing!! Didnt realize that rainbows were actually circles until viewing this.